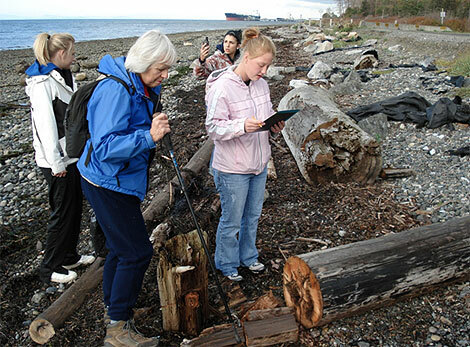 Working in partnership with WSU’s Beach Watchers and Youth Development programs, the high school students were trained to identify creosote and pressure treated driftwood, and to mark them with GPS waypoints which will later be transferred to the Washington Department of Natural Resources. This webpage contains many links and resources that club leaders and teachers can use as activities to teach young people about GPS and GIS. You can easily learn a lot about it yourself, too! The majority of resources are geared for teaching middle school (4-H Intermediate) and high school (4-H Senior) youth. By no means is this an exhaustive list of the resources available. Here you will find clear and simple explanations, (usually animated) and added additional material for engaged learners. The links and resources are ordered sequentially to add more knowledge to that which has already been acquired. The two components GPS and GIS are each sorted into achievement levels. Feel free to use whatever works for you and your youth! Several of these sites require Shockwave or other media playing programs you may need to download in advance. •	Learn how GPS is used in a variety of occupations, and how it works with GIS. Why Should We Pursue this Project? It’s science, geography, critical thinking, it’s visual, it’s active and it’s fun! As quickly as we discover the interdependence of living systems, science defines vast areas of specialized knowledge. Bringing our vast fields of knowledge into a system where they can be analyzed and considered simultaneously, is one mission of GIS. Ours is now a global society and scientists, researchers and surveyors of every kind are collecting data everywhere. GIS is a tool that will help us make sense of the many layers of interaction taking place around us. Beyond science and discovery, GPS/GIS are already used in ever facet of our lives, to manage power grids, sewer systems, cities, people and data. GPS and GIS are tools that are fast becoming a standard in most industries. The job market of the very near future will recognize people with applicable skills and knowledge in this field. Finally, for young people these days, knowledge of the world around them is essential for success. 4-H promotes engaged citizens, and citizens can not be well-engaged unless they are well-informed. Research, critical thinking and problem solving are real skills that are the cornerstones of an effective GPS/GIS project. 4-H offers GIS Internships to advanced youth (usually high school juniors and seniors) in Whatcom County. It includes several hours of online instruction and GIS software. The expectation is that the youth provide their mapping skills to their communities, schools or clubs. For more information about the GIS internship call Michael Wallace 360-676-6736. •	Choose data to gather that matters to the youth and determine how it can be mapped.